DeedGrabber’s Review of www.taxsalelists.com…John Lane and www.TaxSaleLists.com – Scam or the “Real Deal”? John Lane and his site TaxSaleLists.com, in fact provide accurate information about tax sale investing – one of the few out sites about tax sales that do. You’ll probably want to even sign up for the site because of free benefits such as a free tax sale calendar and ability to purchase lists for past and future sales. The question is, “Is tax sale investing really for you?” If you want to get cheap property from tax sales, you’ll hardly ever find it! Discover why this is the case, and how you CAN get properties year-round with little or no competition, in any area of the country, with my “Underground Tax Sale Strategies” report. 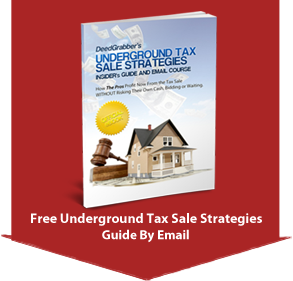 Get the Underground Tax Sale Strategies Guide free when you sign up for our newsletter! Subscribe to the DeedGrabber newsletter now, and receive my “Underground Tax Sale Strategies” report by immediate email delivery.